We just celebrated a belated 20th anniversary (married in the summer of 1996) by taking a trip to China. The gift associated with this milestone year is china, as in fine bone or porcelain, but we went on a guided tour to the country instead to mark our two decades of marriage. After stopping in Taiwan for a few days to visit Islander’s college roommate, Monica C., in preparation for the Harvest Moon Festival, we headed to Beijing, Xi’an, Hangzhou, Wuzhen and Shanghai. Of course, we have witnessed many Chinese chefs making delicious dumplings and we have also eaten our fair share of them during our travel! 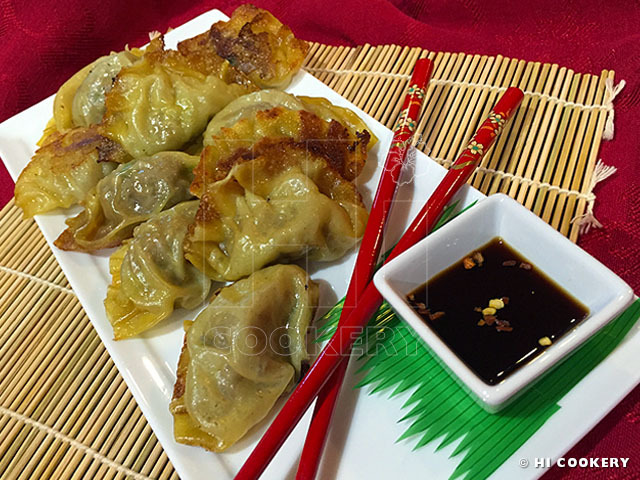 We have made many meat-filled dishes before but one of our favorite dumplings is potstickers. These appetizers are soft yet a bit crunchy at the same time and are very tasty with a dipping sauce. Sure, they are much easier to order at the Chinese restaurant or buy them frozen at the grocery store. But making these potstickers brings back memories of our most recent anniversary trip and it was a good excuse to cook them in observance of National Dumpling Day. 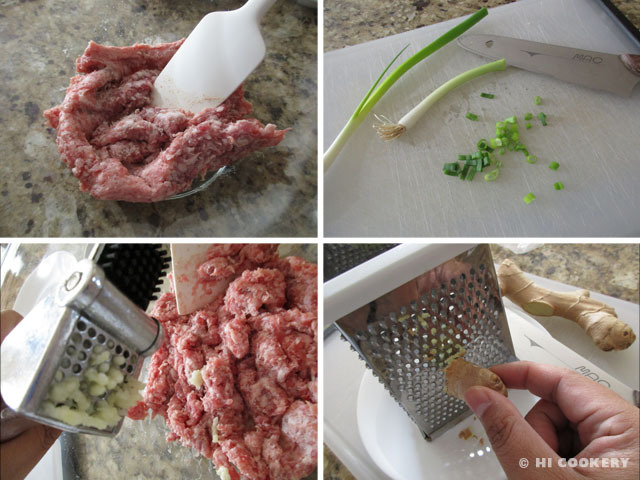 In a bowl, mix the ground meat with the chopped green onions. Add the garlic and ginger. Sprinkle in the sesame seeds. Mix in the soy sauce and rice cooking wine to complete the filling. Moisten the edges of the wrapper with a little water. Scoop a tablespoon of filling onto the center. Fold over into a half circle and seal. Moisten the top outer edge of the wrapper with a little water. Starting on one side, fold a little pleat near the end. Move a little up the wrapper curve and fold a few more pleats. Press down to make sure the pleats are kept folded. 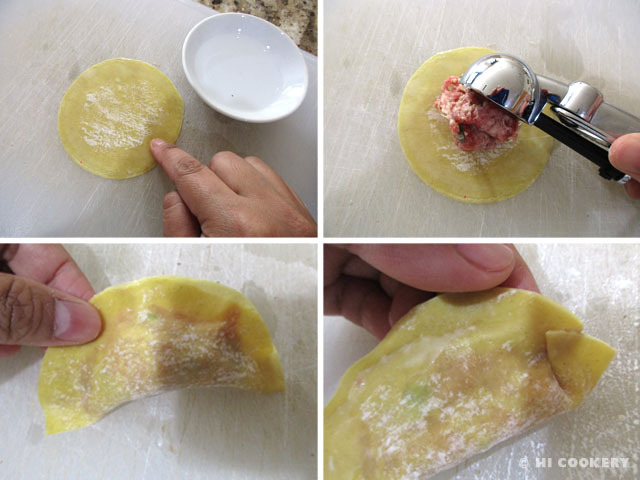 Place each potsticker in a single layer on a waxed paper-lined tray and refrigerate until ready to cook. In a skillet, cover the bottom with a very thin layer of vegetable oil. 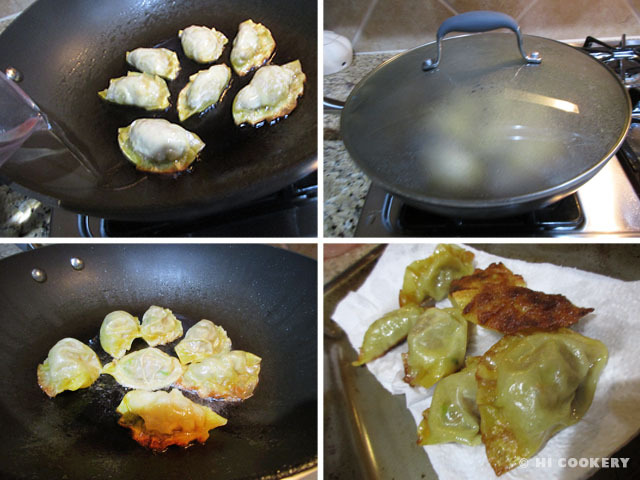 When it is hot, turn down to medium heat and carefully slip the potstickers in the skillet. Avoid overcrowding and overlapping so they do not stick together. Fry until the bottom is slightly browned (about 2-3 minutes). Do not turn over. Pour the water carefully (it will sizzle and splatter a bit). Cover the skillet immediately. Steam until the water has almost evaporated (about 4-5 minutes). 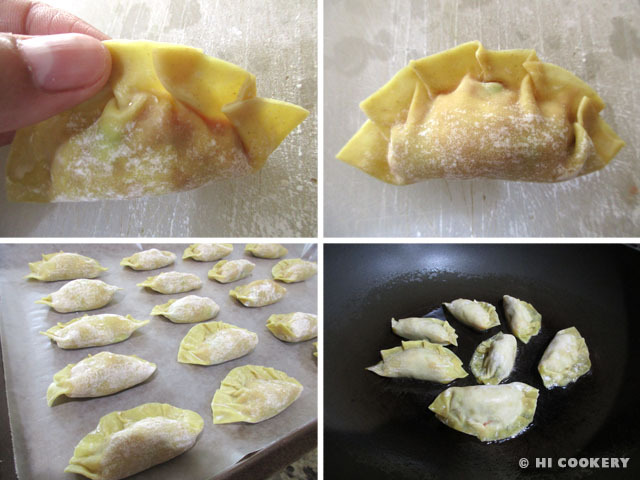 Remove the cover and continue heating the potstickers until the filling is cooked through. Transfer the potstickers onto a paper towel to drain. Serve hot with soy sauce or dipping sauce. 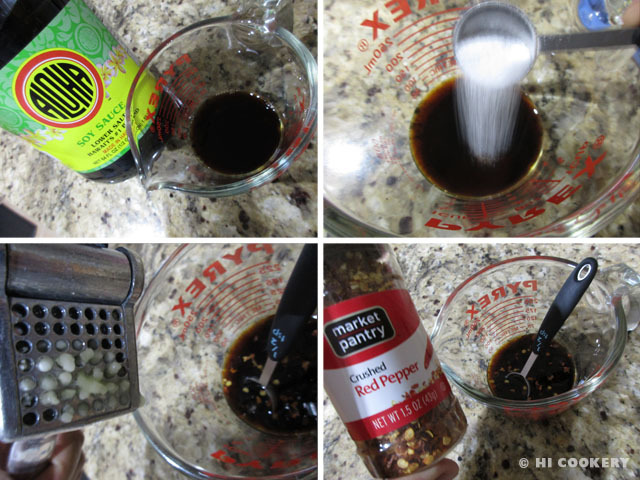 In a measuring cup, combine the soy sauce, rice vinegar and sugar. Stir in the minced garlic. Add the sesame oil. Sprinkle in the red pepper flakes. 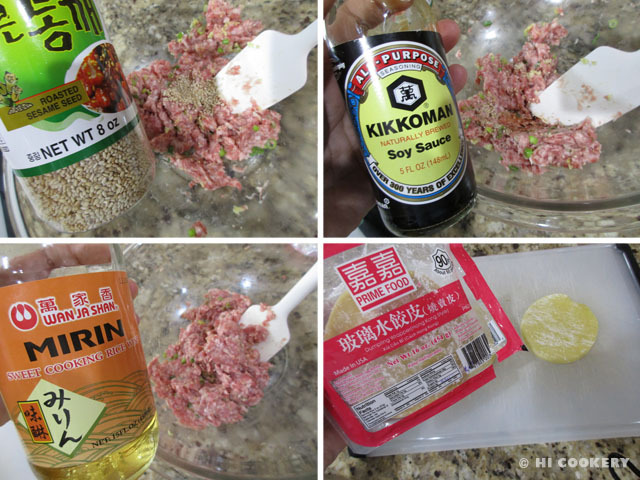 Stir until the sugar has dissolved and the sesame oil has been incorporated. Pour into a sauce dish or ramekin. Serve with hot potstickers. Try some other delicious dumpling recipes from around the world, such as meat bridies, pierogis, chicken curry puffs and empanadas.